I have cried over it. As a kid losing at Draughts, Dominoes, Monopoly. When I wasn’t picked for the Three-legged Race in my final year at Junior School despite winning it three years in a row. When Maxine McBride chose a new best friend. When Mr. Warlow, my Welsh teacher, said he was sorry but he’d somehow got it all wrong: I hadn’t qualified to recite Mae’r Abertawe yn yr haul on the Eisteddfod stage. An ‘O’ level pass in my ‘A’ level English Lit. And later, when I was overlooked for a job, a promotion, time off; when I didn’t make the shortlist, or get the award. When the funding for my first collection was unexpectedly withdrawn. That was a weekend’s worth. in less than a year, so failure isn’t the first word that comes to mind. I say instead ‘it hasn’t worked out’. Perhaps more so for Tony than for me, who has found the language far more of a challenge than he expected, and admits that for the first time in his life he feels ‘so English’, and disconnected from the society around him. He’s far more gregarious than I am and misses the ordinary, everyday things he took for granted in daily life in the UK, from chatting to the woman on the supermarket checkout, to popping along to B&Q on a Sunday morning for some shower sealant, or calling up a friend for an impromptu, last minute drink or dinner. With hindsight, our decision not to deliberately seek out the ex-pat community when we arrived might have added to his sense of isolation. Not that we had much time to socialise in the first 18 months here as the renovation was a ten hour a day, seven day a week project that exhausted us both. But there are other things too. 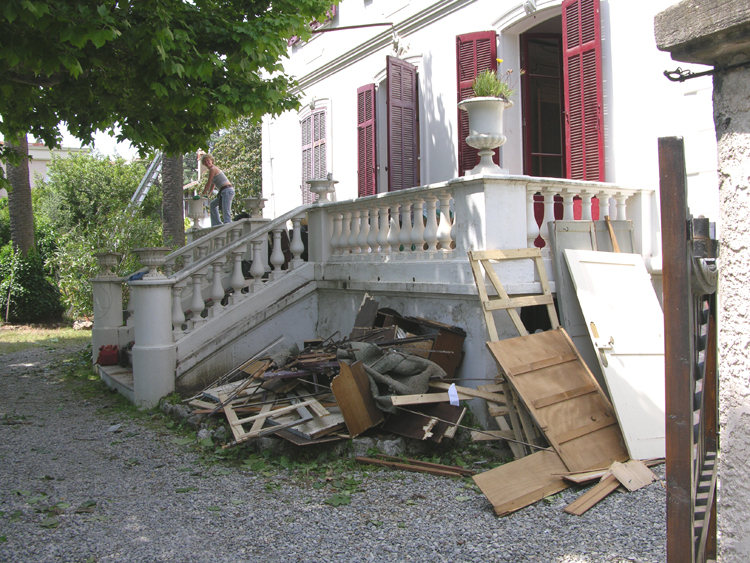 The ‘closed shop’ system that still exists in France which meant, as a private individual, he couldn’t get access to some of the top suppliers of quality building materials. 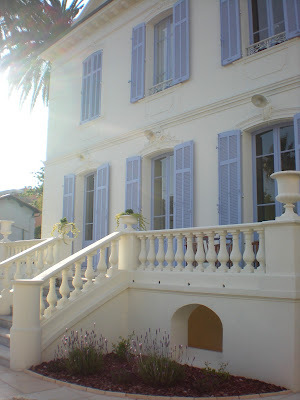 A nasty neighbour’s denoncement of us to the Mairie for changing the colour of the shutters on our house, which, as we quickly found out, you need permission for in Antibes. And Tony's accident. Early one Friday evening at the end of March last year, just as the light was beginning to drop, he misjudged the height of the blade on the table saw as he reached over it to steady the piece of wood. Two operations and months of rehabilitation later he has the use of his hand but his thumb and little finger are permanently damaged. It was only after I left him at the hospital at 10.30 that night, drove home and put away all the tools we’d abandoned in the garden in the rush to get to A&E, wiped up the trail of blood over the marble steps, the staircase and bathroom floor, that I recognised how alone I felt. I’m sure I could have knocked on a neighbour’s door. There were a few people here I could have called. But neither of those things occurred to me at the time. There wasn’t anyone I actually wanted or needed to see, no close friends who knew me, who would turn up and let me cry against them: Michelino and Jan, Bernie and Chris. A few years ago I spoke to a group of anxious writing students about failure. We can’t be afraid of failing, because we’ll stop growing as a writer, I said. We have to look at failure positively. Failure is never about us, it’s about development. Failing at something allows us to understand something more about our writing, about ourselves as writers. It means we have the opportunity to take it further. Positive failure? Yes. 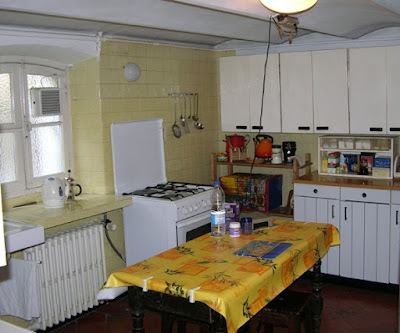 We have restored a house neglected for 50 years and made it beautiful again. Not a day went by during the renovation when someone walking along Avenue des Chênes didn’t stop to say, Elle est belle. Tony has decided he’s too old for any more of this renovation lark, time to relax. I have learned that I need to be with people who I love and who love me more than I thought I did. I’ve forgotten now why I started with The Perfect Fried Egg, and how I hoped to return to it. I think it had something to do with small things, ordinary things. I think I meant to write about being kind to ourselves. And honest. Which I think I might have done. But here’s the egg anyway. Melt a small knob of butter and a little olive oil (to stop the butter from burning) in a frying pan. When it starts to sizzle, set the heat to medium/low, crack in the egg and immediately cover with a close fitting lid and leave for two minutes, and no longer. Voila! Some fresh ground sea salt and black pepper and you have the perfect fried egg, a little crispy around the edges, the centre of the yolk still runny, and not a trace of sloppy white. Write a list of things you have cried over. Write in praise of an ordinary thing in your life. Ah, Lynne, Lynne, Lynne. This made me sad. It is sad. It tugs at something in me that has had to be brave and turn things to the positive. Thank you for sharing these 'recipes' with us. This is beautiful, Lynne. Egg and all. Thank you. Hello, I just read about your blog in the Survive France network. Sorry to have found you when you're deciding to leave France. But you've given it a good try. You write beautifully and I much enjoyed reading the post. Also, your house is just gorgeous! Hope your decision brings you happiness. It's taken me a long time to find your blog Lynne, but good things to those who wait etc. Touching to read this post - and it feels apt and important to me. I often ponder about 'running away' (not that you did, but sort of you know!) and starting again, in part to try to escape the failings of where I am. But perhaps the greater truth is here, try to work with whatever you've got. Make the most of it. Accept the bad with the good. Beautiful renovations! Best wishes for your return to the homeland, and hoping Tony's hand is still recovering well. Hi Jem - yes, 'work with whatever you've got' is a good way to look at life. It probably makes for a more contented existence too. Thanks so much for popping in. So sad to hear how you are feeling right now, and I can empathise with you so much. We have lived in the Auvergne for 6 years now. Hoping to do walking holidays and writing weeks, photography etc. All we managed was B&B, not at all what we expected. It turned out that with the renovation, the taxes, and so many little problems, that can cause weeks of worry, we also made the decision to sell up. We though had started another house renovation to expand our income. Now we have sold the first, will finish this one soon and put it on the market. Very mixed feeling for us both. We take away the fact that we did it! We moved, tried to learn the language. Have gained some wonderful friends, French and English, Dutch and Belgian. There is a lot to go home with. Our son marries next year and I think that made the decision for Jane, she wanted to be part of that. So there we are. Thanks so much for your kind words, Jim. It's great to hear from someone who understands how little things can be so trying and difficult to arrange/organise in France. But, yes, so many positives to take back with us too. Take care.